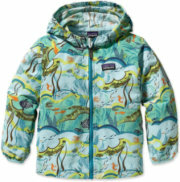 Patagonia makes environmentally conscious, high-performance outdoor apparel for babies. We make our cute baby fleece and tees for wee ones to help show off your kid's cuteness. We use only good things in our kids' clothes, like recycled fleece and pure, clean organic cotton. 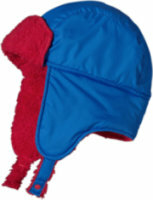 Patagonia Baby Shelled Hat - The Baby Shelled Hat by Patagonia. The weatherproof and full-coverage Baby Shelled Hat is made of durable, all-recycled polyester shell fabric and insulated with warm polyester high-pile fleece; double snaps on chin allow for a secure fit. FEATURES of the Patagonia Baby Shelled Hat. SPECIFICATIONS of the Patagonia Baby Shelled Hat. Paneled construction for a snug fitShell and warm plush fleece combination is wind- and water-resistantRegular fitDouble snaps on earflaps snap-up on top of hat or under chin for secure fitLong earflaps protect ears in cold weatherMade in China. Patagonia Baby Sun Bucket - This hat denies searing sun with its generous wraparound brim. Made from long-wearing, 4-ply Supplex nylon in a reversible two-color option, it has a DWR (durable water repellent) finish that sheds water. The soft chin strap holds bucket in place without chafing young jaw lines and tucks away when not in use. Wraparound brim to protect precious skin from sun. FEATURES of the Patagonia Baby Sun Bucket Hat. SPECIFICATIONS of the Patagonia Baby Sun Bucket Hat. Patagonia Baby Synchilla Booties - The Patagonia Baby Synchilla Booties. Keep tiny feet warm in our easy on/off Synchilla Booties, made of soft recycled polyester double-faced fleece, with a new stay-put design. 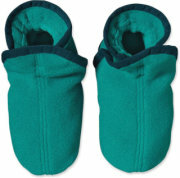 FEATURES of the Patagonia Baby Synchilla Booties. SPECIFICATIONS of the Patagonia Baby Synchilla Booties.2-layer sole construction for extra cushion and nonslip safetyRegular fitElasticized pull-on booties that stay-put around ankle for a secure fitMade in Mexico.13.3% spandex33.7% polyurethane skid less jersey. Patagonia Baby Baggies Shorts - The Patagonia Baby Baggies Short is a swim short for babies to enjoy a day at the pool or beach. The Supplex nylon dries quickly and features a durable water repellent finish so spills shed off before getting soaked in. An elastic waistband with a button adjustment is soft against tiny tummies for a full day of fun in the sun. The Baggies sport plenty of room for diaper bums. 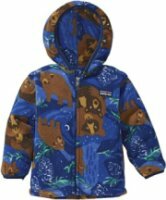 Patagonia Baby Otter Snowsuit - Patagonia made this fully featured snowsuit to keep babies warm and dry in nasty, wet weather. Here’s the 411 on the Otter: the H2No® Performance Standard waterproof/breathable 2-layer polyester shell fabric has fully taped seams, and the warm 150-g Thermogreen® insulation (90% recycled) stays dry even when wet. The suit’s weather-stopping features include: a snug, three-panel hood with an elasticized gusset under the brim to keep out the cold, a front zipper with an internal zip cover and an external wind flap with a hook-and-loop closure, and internal leg gaiters with straps that will fit under boots to shun snow. Patagonia Baby Synchilla Hat - The Baby Synchilla Hat by Patagonia. Patagonia's full-coverage, Baby Synchilla Hat made of soft, double-faced fleece (solid has 85% recycled polyester/print is 100% polyester) keeps little heads warm and comfortable. FEATURES of the Patagonia Baby Synchilla Hat. SPECIFICATIONS of the Patagonia Baby Synchilla Hat. Double-layered extended brim holds its shape and provides protection from wind/snowAdjustable two-snap chin strap for secure fitRegular fitWarm polyester double-faced fleeceFlat-seam construction reduces bulk for greater comfortMade in Mexico. 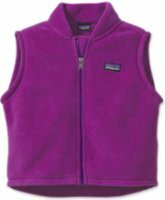 Patagonia Baby Synchilla Vest - The Baby Synchilla Vest is Patagonia's versatile full-zip baby vest, made of warm polyester double-faced fleece can be worn alone or with layers. Mom and Dad like this vest for its core warmth, easy on/off construction and soft durability. Babies like it because it coddles their six-packs and lets them show off their biceps. Made of 100% polyester (85% recycled, solids only) double-faced fleece, with a full-zip entry backed by a wind flap, a tapered, nonchafing stand-up collar and a drop-tail hem. Patagonia Baby QT Swimsuit - The cake is that the QT Swimsuit provides her with more complete sun coverage than a two-piece and in a soft and durable stay-put design. The icing is its undeniable cuteness: ruffles at the neckline, festive stripes and dots and blossoms offset with contrast binding, and the wide cross-back straps with keyhole opening detail for comfort and QT style. Made of a stretchy 82% nylon/ 18% spandex blend in an easy-on/off over-a-diaper fit. 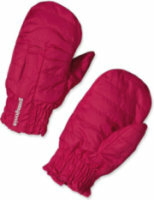 Patagonia Baby Puff Mitts - The Patagonia Baby Puff Mitts. Keep small mitts toasty in our Puff Mitts, made with a wind- and water resistant 100% recycled polyester fabric and 60-g Thermogreen insulation; lined with high-pile double-faced fleece. FEATURES of the Patagonia Baby Puff Mitts. SPECIFICATIONS of the Patagonia Baby Puff Mitts. Shell/plush fleece combination is wind- and water-resistant, lightweight and warm; 60-g Thermogreen insulation stays warm even when wetRegular fitThumb compartments on all sizesElasticized cuff keep mitts on and cold outMade in Vietnam. Patagonia Baby QT Swimsuit - The soft and stretchy one-piece design of the Patagonia QT provides better sun coverage than a two-piece swimsuit and a superior stay-put fit for a baby girl hell-bent on scooching and shinnying. Ruffles at the neckline, festive stripes and dots and blossoms offset with contrast binding add style, and the wide cross-back straps with keyhole opening detail offer high-end comfort and style in a baby swimsuit. Made of a durable 82% nylon/18% spandex blend in an easy-on/off over-a-diaper fit. Patagonia Baby Down Sweater - Patagonia's easy-to-layer Baby Down Sweater, made of a wind- and water-resistant polyester ripstop fabric is insulated with warm and compressible high-loft 600-fill-power premium European goose down. Think of this as your baby's on-the-go down comforter. The Down Sweater wraps them in soft warmth yet blocks wind and water when conditions get dicey. Lightweight and highly compressible, this jacket has high-loft 600-fill-power European goose-down insulation to keep them warm during long winter escapades. 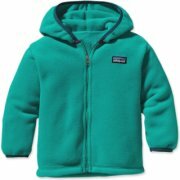 Patagonia Baby Synch Cardigan - FEATURES of the Patagonia Baby Synch Cardigan. SPECIFICATIONS of the Patagonia Baby Synch Cardigan. 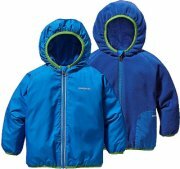 Flat-seam construction for chafe-free comfortFull-length zipper with a fleece wind flapElastic binding on hood and sleeves provide snug fitRelaxed fitsGenerously sized for easy layeringHand-me-down ID label. 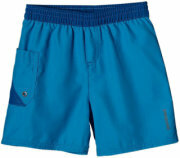 Patagonia Baby Daybreak Boardies - FEATURES of the Patagonia Baby Daybreak Boardies. SPECIFICATIONS of the Patagonia Baby Daybreak Boardies. Contrast stitching throughoutMade of lightweight and durable microfiber polyester that dries fast3.7-oz 100% microfiber polyester, with a brushed face and a DWR (durable water repellent) finishRegular fitContrast elasticized waistband with adjustable drawcordRight patch pocket with contrast detail and drain hole. 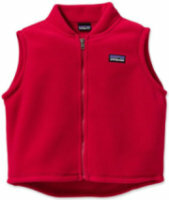 Patagonia Baby Synchilla Vest - The Patagonia Baby Synchilla Vest. Our versatile full-zip baby vest, made of warm polyester double-faced fleece can be worn alone or with layers; (Solids: 85% recycled polyester). 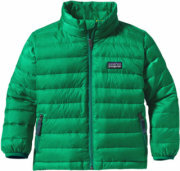 FEATURES of the Patagonia Baby Synchilla Vest. SPECIFICATIONS of the Patagonia Baby Synchilla Vest. This garment has a Relaxed FitTapered stand-up collar; wind flap on zipperPolyester double-faced fleece is warm and soft7.6-oz 100% polyester (85% recycled) double-faced fleeceHand-me-down ID labelDrop tail provides additional coverage. Patagonia Baby Baggies Jacket - The Baby Baggies Jacket keeps your micro grom comfortable and dry in everything from afternoon onshores to summer showers. 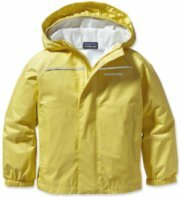 This lightweight and packable baby windbreaker jacket is made of 100% Supplex nylon with a DWR (durable water repellent) finish that sheds moisture and makes on-the-go cleanups a snap. With an ergonomic, stay-put hood, an easy on/off zip front and two handwarmer pockets.4-ply, 4.2-oz 100% Supplex® nylon, with a DWR (durable water repellent) finishSide elastic on hood for a comfortable, stay-put fitHand-me-down ID labelZipper garage protects chinRaglan sleeves with spandex binding at sleeve openingTwo handwarmer pockets double as stow pocketsMade in Vietnam. 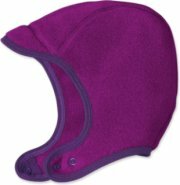 Patagonia Baby Shelled Hat - The Patagonia Infant Baby Shelled Hat comfortably covers and protects your infant’s head from the cold, rain, and snow. This weatherproof and full-coverage hat with double snaps on chin keeps him or her nice and toasty when you go out during the winter months. Plush fleece interior is incredibly soft and warmWeather-resistant recycled ripstop polyester shell features a Durable Water Repellent finish to shed light precipitationPatagonia Baby Shelled hat has paneled construction for a snug fitLong earflaps with double snaps provide storm coverage; they fold up and snap out of the way when the sun starts shining. 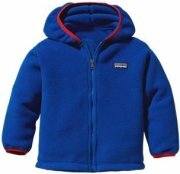 Patagonia Synchilla Cardigan for Baby - Warm polyester double-faced fleeceFlat-seam construction for chafe-free comfortFull-length zipper with a fleece wind flapWarm polyester double-faced fleeceElastic binding on hood and sleeves provides snug fitGenerously sized for easy layeringHand-me-down ID label. Patagonia Baby QT Swimsuit - Patagonia Baby QT Swimsuit. A one-piece swimsuit for babies; made of a stretchy nylon/spandex blend in a stay-put fit. This garment is Formfitting The cake is that the QT Swimsuit provides her with more complete sun coverage than a two-piece and in a soft and durable stay-put design. The icing is its undeniable cuteness: ruffles at the neckline, festive stripes and dots and blossoms offset with contrast binding, and the wide cross-back straps with keyhole opening detail for comfort and QT style.